What was the last Eastwood film you watched? Re: What was the last Eastwood film you watched? That’s fair, Perry. You are welcome to not be a fan. It sounds like you feel about Amy Adams the way I feel about Barbara Streisand. I recognize that she can sing, but I’ve never liked her music. How about this one: True Crime. It had been a long time I didn't see it. Once started rewatching I remembered everything. I remember back then it hadn't many positive reviews. I felt very upset this time, I thought Isaiah Washington character so conformed about being accused for a crime he didn't commit... and after six years everything was solutioned in one day because of a necklace as a the key of the whole case? The scenes between Beechum and his wife were too whiny and over the top played but how it wouldn't be it, was a sad situation. I remember the father of the girl that played Gail used to post on the board back then. But I like the movie it brings me a lot of good memories. How about you, I'd like to hear your opinions if you agree or disagree on some those points. I thought Clint was too old for the part (he wasn't really credible as the eternal rake). But it was well cast otherwise. Bernard Hill was particularly outstanding as the warden, and I loved Clint's exchanges with Denis Leary as the editor whose wife he was having an affair with. I've never really liked Leary after he was caught stealing material from one of my favourite comedians Bill Hicks..
James Woods was great too. I think Eastwood was fine in the central role as the reporter, but would have gotten rid of certain aspects of the character, such as him being a womanizer and having a much younger wife and young daughter, when Eastwood was cast. True Crime is a pretty good picture, in my opinion. Not among the best films of Clint Eastwood though. Between 1992 and 1995, Clint was in state of grace. Indeed, he did Unforgiven, In the Line of Fire, A Perfect World and The Bridges of Madison County which were well received by the critics. Of course, he won his first Oscars in 1993 for Unforgiven. After The Bridges of Madison County, he did Absolute Power, Midnight in the Garden of Good and Evil, True Crime, Space Cowboys and Blood Work. These last five movies are often considered as minor pictures in Clint's filmography. Maybe the scripts were too predictable. Maybe Clint was too old for True Crime and Blood Work: in the novels, the main characters were younger than Clint. Space Cowboys was a little bit successful at US box office. However, these movies contain some qualities, Midnight in the Garden of Good and Evil included. Steve Everett is like Ben Shockley in The Gauntlet: a professional with some personal weaknesses like alcoholism. In True Crime, I especially like the scenes between Clint and James Woods. Very funny. I like the interview sequence between Clint and Isaiah Washington in San Quentin prison too. The collaboration between Clint and jazz singer Diana Krall with the song "Why Should I Care" is fine. About the ending, we can have many interpretations: Has Frank Beechum been saved ? If we were optimistic, we would say that Frank Beechum survived and joined his family for Christmas. If we were pessimistic, we would say that Steve Everett had a mental vision in which he saw Frank Beechum with his family. I think that it's a good reflection on happy endings in Hollywood. I understand what you mean, AKA23. But on other hand, I think that in True Crime, Clint talked about himself through Steve Everett's behavior. Steve Everett's daughter was actually played by Francesca Eastwood. And with all due respect, Clint would have been a womaniser. If Eastwood were playing himself, this may have worked, but since he was playing a character in a movie, I don't think it did. Steve Everett wasn't a particularly wealthy guy, and in our society, it is extremely rare to see a much younger woman with an older guy, unless that guy is extremely wealthy and the woman is motivated to be in the relationship for the swanky lifestyle it affords her. It's also even rarer to see a nearly 70 year old man having a 6 year old daughter. It's interesting that you commented that Clint may have been talking about himself through his portrayal of Everett, though. I'm not sure that's true, but after seeing the trailer for "The Mule," my brother had a similar reaction. He remarked that it seemed like Eastwood was very fond of redemption stories and asked me whether he may be trying to atone for his own behavior as a father and husband through his art. These are all good points. AKA, when I read your first post, I was going to say you couldn't so easily "get rid of" certain aspects of Ev's character, since the point was that he was a failure at everything else, in particular being a good husband and father, but was a paragon as a reporter. But that's more or less what you said in your second post. Clint was fine as the reporter, but because of his age, not so believable in the other aspects of the character he was playing. And Hocine, I love that you pointed out the parallels between Steve Everett and Ben Shockley. The Gauntlet is an earlier "minor picture" of Clint's that I'm particularly fond of. Aline and Hocine, thanks for mentioning James Woods His scenes with Clint are outstanding, and I should have named them ahead of Clint's with Leary. It's been too long since I watched this one. Good points, Hocine, but at the ending it's not a matter of being optimistic but I think they were really Beechum and his family, Everett not even knew his wife and kid to have a so "clear" vision. And the way they look at each other and Steve takes the cigar down on the floor like something has changed inside him. The big coincidence is they were walking down the same area at the same time. Suspension of disbelief in this movie is really indeed. I think Clint was trying to be faithful to the book on which which this was based, and that included both him saving Beechum, his womanizing ways, and his young daughter. In the book, the reporter was much younger, similar to the age of the character in the novel "Blood Work. Come to think of it, that is another movie that should have gotten rid of the younger woman/older man romance, which also wasn't the best fit for the 72 year old Eastwood. KC, as you know, Clint is fond of these stories depicting human frailties that have the potential to become the downfall of otherwise talented or accomplished men. In addition to "The Gauntlet" and "True Crime," this theme is quite pronounced in "Honkytonk Man" and "White Hunter, Black Heart" as well. I also think that Frank Beechum was saved and survived. And I was really happy to see Frank Beechum alive and free. Everett hasn’t seen Beechum’s daughter before the ending but has seen Beechum’s wife during the interview. I just wanted to say that the last sequences were edited in a way that you can ask yourself: did they really make it or not ? I think that in Hollywood movies, many endings don’t fit with the rest. That’s why it’s hard to see a convincing ending in a movie, sometimes. For instance, many main characters should have been dead in movies but survived because of Hollywood conventions, box office, financial factor. Sometimes the audience, screenwriters, producers, directors or stars don’t want the hero to die and want him to survive. Some people just don’t like depressing movies. I think that True Crime’s ending can illustrate this reflection. In White Hunter Black Heart, John Wilson and Pete Verrill have an interesting conversation about Hollywood. But Clint is not afraid to make depressing movies. My man is releasing another starring role film this week, so I decided to watch the 3 Leone westerns yesterday. Westerns have been a favorite movie genre for as long as I can remember and this is my favorite trilogy by anyone. Just incredible. I loved revisiting these again, something I haven’t done in over a year when I had the opportunity to see them on the big screen in Cambridge, Massachusetts. Watching them again is a great primer for The Mule this Friday. Funny thing is, Gant only “thinks in Russian” once, the other pilot commands from him are verbal. I don’t recall wondering in prior viewings how strange it was that Gant was running from a U.S. military helicopter, surely he recognized it... Of course, his PTSD could’ve been triggered by the sudden appearance of the copter. I can’t remember if that’s explained in the novel. I enjoyed reading it and the sequel, Firefox Down!, very much. Still, it was nice revisiting this film again. I would edit it to make it tighter, more suspenseful. 30-40 minutes could easily be scrapped. Had I sat down to watch this movie straight on from beginning to end, I’d have dozed off. It was perfect having it on as I wrapped Christmas presents. 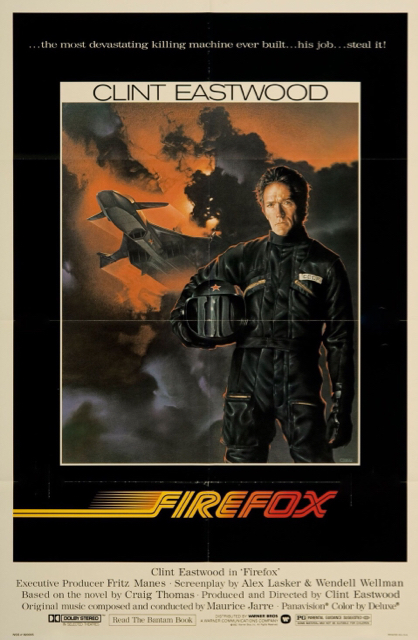 Firefox was the very first ticket I’d bought for a large screen Eastwood movie and for that reason it’s special to me even though it’s not a favorite. It was a nice walk down memory lane.